Here is the Weather Forecast. Top left inset: Matthew Fontaine Maury, whose new type of meteorological charts made it possible to determine the exact position of an overdue vessel. Top centre inset: Vice-Admiral Fitzroy who committed his government department to a forecasting service which landed him in trouble; he even sent his gale warnings to newspapers for publication. 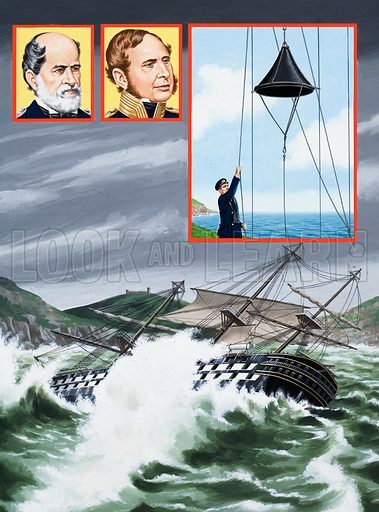 Top right inset: a coastguard hoists a gale-warning cone with the pointed end upwards indicating that a northerly gale can be expected. Main picture: even experienced mariners were liable to find themselves in difficulties when sailing round the rocky coast of Cornwall. Adverse weather conditions could easily result in the ship being wrecked and the lives of the crew lost. Original artwork for the illustrations on p15 of L&L issue no. 969 (4 October 1980). Available worldwide for immediate download up to 3,442 x 4,649 pixels.